I am home now. Stay was only 10 days, but my sickness made me feel longer. Anyway, I am safe back to home, thanks all. On 10th, I left the hotel in Lannion at 8h, arrived at the office in Issy at 14h, and had a meeting until 17h. 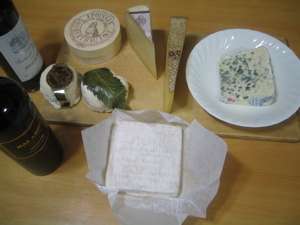 Olivier took us to a fromagerie and a cave near the office to buy cheese and vins. Then called a taxi from the office, got a traffic jam, then arrived at CDG at 20h. The plane took off at 23h30, and arrived at NRT at 18h50 in Japan time. The door opened at 18h55, passed immigration and custom, bought a ticket for NEX, and made it to get on NEX of 19h13. Quite a good job. I sat the 28th row in the plane, was the 2nd at immigration, and faster than anyone at the exit 🙂 I always travel with cabin bags, so I never wait for luggage. For other days in France, I will post later. HTML convert time: 0.334 sec.